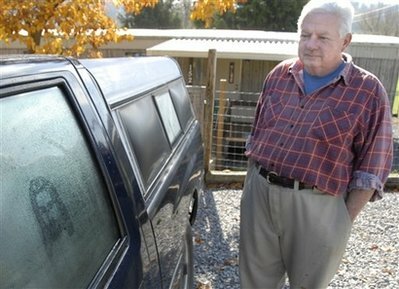 (AP) - Jim Stevens stands next to his truck that has an image of Howard Stern on the window Monday, Nov. 2, 2009 in Jonesborough, Tenn. The image has been there for two weeks and appears every morning when the morning dew is on the window. Stevens says he doesn't listen to the radio much and is clueless about why an image of Howard Stern keeps appearing on his pickup. Officials think it's a new publicity stunt by the XM radio host.